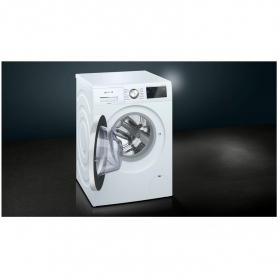 The WM14T690GB is a freestanding washing machine featuring the latest, cutting edge technologies. 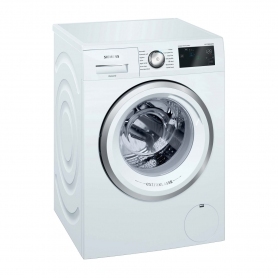 It comes with a classic white/silver trim finish and is exclusive to Euronics and Agent stores – so you won’t find this amazing machine anywhere else. For a limited time only, this appliance comes with free delivery, installation and disposal of your old appliance*. 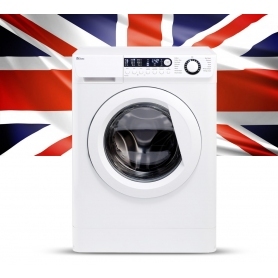 A large 9 kg drum makes this washing machine ideal for families – able to wash up to 45 t-shirts in a single load, it will get through your laundry pile even quicker. And, with a spin speed of 1400 RPM, your clothes will take less time to dry, saving you time and money. There’s even a digital multi-touch display, which makes it easy to select programmes and additional functions. You’ll also find a consumption indicator on the control panel, showing information about your selected programme’s water and energy usage before the wash starts. 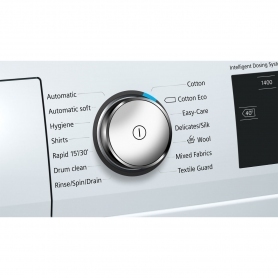 Siemens has designed the WM14T690GB to make washing easier and quicker than ever before, so you can enjoy the finer things in life. The i-Dos detergent drawer can hold up to 20 washes of liquid detergent and fabric softener. If you did five washes per week, you wouldn’t need to worry about refilling for a month – and a handy indicator light will let you know when it needs topping up. Once you’ve selected a programme, intelligent sensors detect the load’s size and level of dirt. This system determines how much water and detergent is needed for that wash, helping to prevent any wastage. This Siemens extraKlasse machine also has two Automatic programmes. These detect the laundry’s fabric type and adjust the entire wash cycle for outstanding cleaning results. If you’ve spotted a stray sock and the machine’s already started, then not to worry. The WM14T690GB comes with the ReLoad function, which lets you pause the cycle to add any forgotten items. 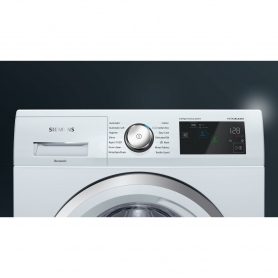 As well as two Automatic programmes, this Siemens washing machine offers 13 other programmes. So, whether you need to wash shirts, cottons or mixed items, you can expect an impeccable clean. There is one programme that really stands out though – the Rapid 15. This allows you to wash a small load in just 15 minutes, which is particularly convenient when you’ve run out of work clothes or school uniforms for the Monday morning rush. The WM14T690GB also comes with the varioPerfect function. Select either speedPerfect to reduce the cycle time by up to 65%, or ecoPerfect to decrease the energy usage by up to 50%. What’s more, you can expect perfectly rinsed laundry, time after time. Using sensors to check the rinse water’s cloudiness, the HydroSensor monitors and optimises the number of rinse cycles. When buying a new appliance, you want to be sure it will last, and that running costs won’t be too high. With the WM14T690GB, you can rest assured that Siemens has kept these two factors in mind. The brushless iQdrive motor is not only quieter than standard motors, but it also comes with a 10 year guarantee. And, with energy efficiency at the core of its design, this Siemens washing machine has an A+++ -30% energy rating. That means that it’s 30% more energy efficient than the highest rating available – helping you to save money and the environment. This innovative Siemens washing machine will make a real difference to your daily life. Get through the laundry faster and more efficiently than ever before. Order yours today.